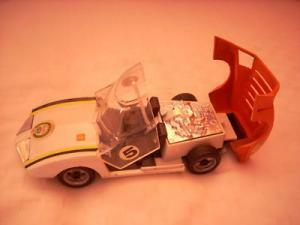 Here is a rare Diecast 1/24 scale version of the Chevrolet Corvair Monza GT showcar. It weighs about 1 1/2 pounds! The car itself is in great condition. The clear canopy's plastic hinges are broken...which is common and does not show on the outside. I propped it up with a qtip in the photo.